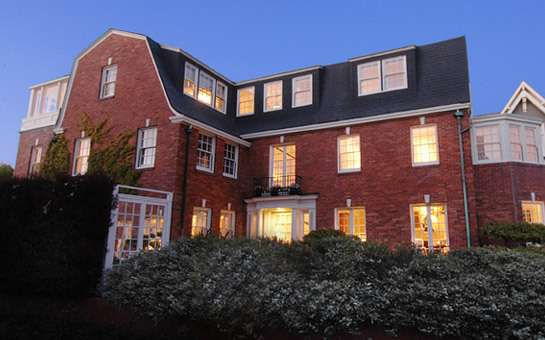 Handsome, rare, three story Dutch colonial designed by Frederick Ashley, who is recognized on the National Register of Historic Places for his revival styles of architecture. An impressive free standing residence with classic gambrel roof and brick façade, situated on an unusually large garden parcel at the pinnacle of Pacific Heights. Many paned windows and French doors allow an abundance of natural light to fill the house from all directions. Enjoy day and nighttime vistas of the Golden Gate Bridge, Bay and many of the City's landmarks! The house exudes traditional elegance with great warmth. The floor plan is ideal for indoor/outdoor entertaining and comfortable City living with the ambience of a country estate. Ascend the gated and bricked walkway along the impeccably landscaped garden to the classic formal entry flanked by a pair of columns and sidelights. The beautiful hardwood floor, crown molding, and paneled wainscot of the FOYER introduce the fine architectural detailing found throughout the house. Multi-paned mirrored doors reflect light and space. A graceful staircase with handsome banister, carved pilasters and wall sconces soars three floors to an impressive brass lantern crowning the stairwell. The warm and inviting LIVING ROOM with wainscoting and verdant garden views welcomes guests. The fireplace has a fine, original, carved wood mantel. The cozy alcove overlooks a south garden secluded from the street by a formal hedge and French doors view the west garden, entryway and neighboring estate. The formal DINING ROOM with elegant 19th century chandelier, and attached marble side table, can seat a large dinner party. Azaleas and Italian Cypress lining the 9 foot garden wall just outside the west facing windows are spot lit for romantic dining. Beyond the breakfast area is a concealed moveable mirrored pass-through with wet bar & refrigerator, convenient for beverage service to the living room. The charming GARDEN ROOM/OFFICE with French doors opens to the secluded, gated and mirrored COURTYARD GARDEN designed by landscape architect, Topher Delaney. A 9 ft wall espaliered with dogwood and camellias provides privacy and security. The GUEST BATH with pedestal sink has a separate shower. Off the foyer is a hallway with two concealed storage closets and a guest closet that opens to the breakfast area, the basement and laundry room. The sunny MASTER BEDROOM with handsome carved wood fireplace mantel and alcove bay overlooks the tree-lined street to City views. Built-in custom closets with shoe storage line one wall. The luxurious MASTER BATH features a spa tub, separate glass enclosed shower, double vanities, built-in make-up table with concealed vanity lights, cosmetics storage and jewelry safe; extra closets adjoin. The marble topped beautiful wood cabinetry, spa surround and distinctive mirrors have specialty fine furniture finishes. The handsome marble-edged floor is laid in leather. The N/E corner BEDROOM, presently furnished as a gentleman's sitting room, adjoins the master bath. It also has a wall of built-in closets & shoe storage drawers, a wood-burning fireplace and classic carved mantel. The N/W BEDROOM enjoys a private balcony with views of neighboring gardens, the Bay and eastern hills.. It has its own adjoining fully tiled BATH that can be shared with the two adjacent bedrooms. The bright, centrally located west BEDROOM would make a charming nursery or child's room. It is also ideally located to be used with the N/W bedroom as part of a guest suite or teen suite/study/office. ADT security system installed at all entry/exits. 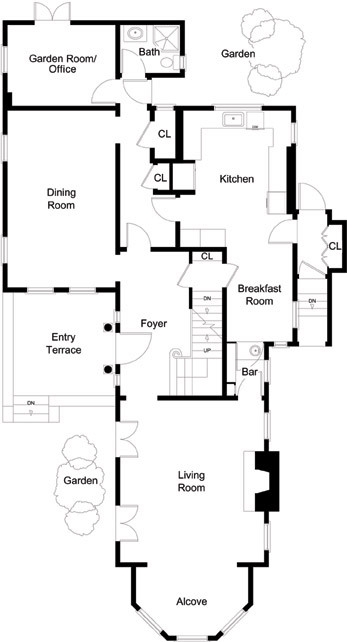 Separate service entrance and secure pass-through/pantry to rear garden and kitchen. Offers to be delivered to TRI Coldwell Banker by 11:00 a.m. on Friday, May 18th.